FieldTurf artificial grass is the most preferred choice for Football fields for its safe, low-to-no maintenance and all-weather playability aspects. Unlike natural grass, FieldTurf synthetic turf Football fields do not become patchy, boggy and uneven. 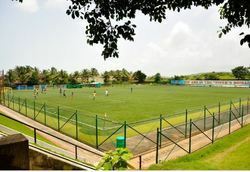 We are perfected hybrid grass system for top-level tournaments, multifunctional sports pitches, venues with a busy schedule and state-of-the-art training facilities. 20 million in-house produced High Performance Fibres (HPF) deliver a reinforced natural grass playing surface that is proven to last for up to 15 years or more. 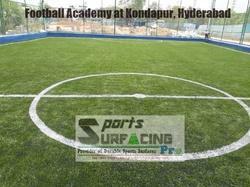 - As an esteemed organization of this domain, we are engrossed in presenting a broad spectrum of Artificial Sports Turf. we are importers of 50 mm football turf, FIFA 2 approved.